Three 11-year-old friends who had just finished taking a summer lifesaving course are being praised for their quick thinking after pulling two swimmers from water at a Surrey, B.C., beach. 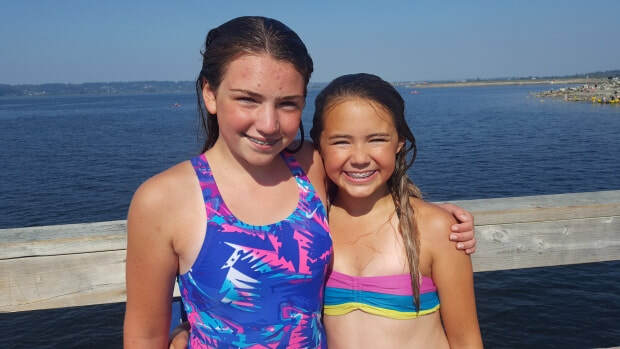 Georgia Springate, Kate Hunter and Lily Cox were at Crescent Beach earlier this month, jumping off the pier and splashing around in the water, when they noticed two people caught up in a current. "This girl was in the water — I think she was about 20 — and her friend had asked us to go help her, so we swam over," Georgia told Gloria Macarenko, CBC's guest host of On The Coast. Lily pulled the woman to the pier while the other two girls attempted to get the second swimmer — believed to be about 13 and fully clothed — to safety. "We tried to help her get to the ladder but the current was too strong," Georgia said. "So we tried to bring her to the shore and then once she could touch, we swam away." The three friends had taken a junior lifesaving class at Crescent Beach Swim Clubthis summer, and Georgia said they were confident in their skills. "We just reacted; it was kind of like an instinct," she said. "It looked like she had been there for a while and the water was pretty cold, so I don't know if she would have made it on her own." The friends say the swimmers appeared in shock after they were pulled from the water incident and thanked the girls. Georgia's mother, Cynthia Springate, witnessed the incident. "As a mother, it was scary in the moment," Springate said. "This was a dangerous scenario. These girls were starting to bob under the water as our girls approached them, and, at any time, this could have turned into a rescuer-becomes-the-victim." Springate said she is proud of the girls but concerned that a rescue was needed at all. "I was somewhat upset that here were girls who apparently were not being clearly watched by their parents," she said. "One girl was fully clothed in the water. She was not even prepared for swimming at the time." "Those two girls were really lucky that [the three 11-year-olds] were all in the water for them," Springate added. Georgia said she wasn't afraid at the time. She plans to take more lifesaving classes next summer.